The relationships between different financial markets are almost as old as the markets themselves. The relationships between different financial markets are almost as old as the markets themselves. For example, in many cases when benchmark equities rise, bonds fall. Many traders will watch for correlations like this and try to capitalise on the opportunity. The same types of relationships exist in the global foreign exchange market. Take, for instance, the closely-related tie between the Australian dollar and gold. Due mostly to the fact that Australia remains a major producer of the yellow metal, the correlation is an opportunity that not only exists, but is one that traders on every level can capitalize on. Let's take a look at why this relationship exists and how you can use it to produce solid-gold returns. The U.S. dollar/crude oil relationship exists for one simple reason: the commodity is priced in dollars. However, the same cannot be said about the Aussie correlation. The gold/Australian dollar relationship stems from production. Australia is one the largest gold producer in the world. As a result, it is only natural that the their currency follows a similar pattern to gold. With the ebb and flow of production, the exchange rate will follow supply and demand as money exchanges hands between miner and manufacturer. Although the macro strategy does work on all levels, it is best suited for portfolios that are set in longer time frames. Traders are not going to see strong correlations on every single day of trading, much like other broader market dynamics. As a result, it's advantageous to cushion the blow of daily volatility and risk through a longer time horizon. As a result, these trades tend to be longer than day-trade considerations as the portfolio is looking to capture the overall market tone, rather than just an intraday pop or drop. Technically, traders tend to find their cues in technical formations with the hope that corresponding correlations will seep into the related market. Whether the formation is in the gold chart or the Aussie chart, it is better to find one solid formation first, rather than looking for both charts to correlate perfectly. An example of this is clearly seen in the chart examples below. As shown in Figure 2, with the market in turmoil and investor deleveraging that was "en vogue" in 2008, traders saw an opportunity to jump on the bandwagon as both Aussie and gold experienced a temporary uptick in price. Already knowing that this would be a blow-off top in an otherwise bearish market, the savvy technical investor could visibly see both assets moving in sync. As a result, technically speaking, a short opportunity shone through as the commodity approached the $905.50 figure, which corresponded with the pivotal 0.8500 figure in the FX market. The double top in gold all but ensured further depression in the Australian dollar/U.S. dollar currency pair. Now let's take a look at a shorter trade setup involving both the Australian dollar and gold. First, the broad macro picture. Taking a look at Figure 2, we see that gold has taken a hard dive down as investors and traders have deleveraged and sold off riskier assets. Following this move, subsequent consolidation lends to the belief that a turnaround may be lingering in the market. The idea is supported by the likelihood that equity investors will elect to move some money into the safe-haven characteristic of the commodity as global benchmark indexes continue to decline in value. 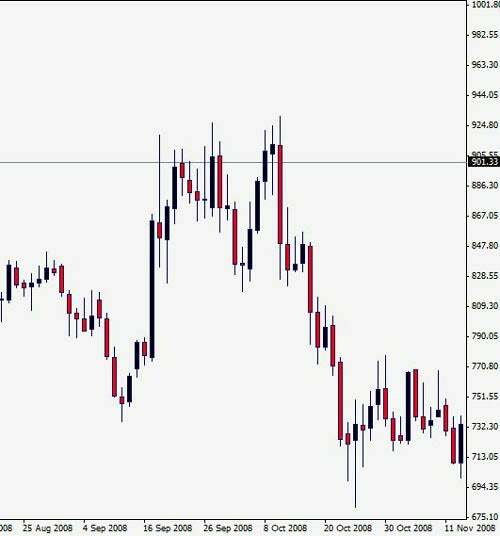 We see a similar position developing in the Australian dollar following a spike down to just below the 0.6045 figure, shown in Figure 4 below. At this time, the currency was under extreme pressure as global speculators deemed the Australian dollar a risky currency. Putting these two factors together, portfolio direction is looking to be upward. 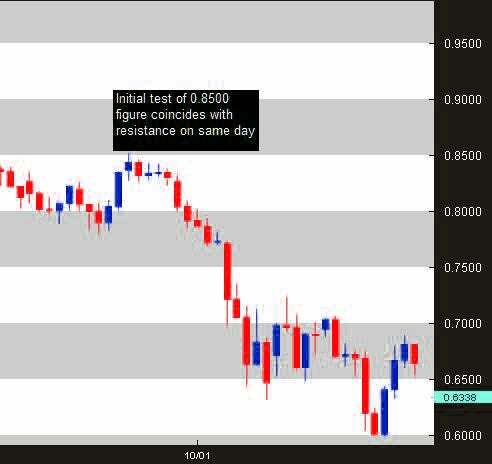 Next, we take a look at our charts and apply basic support and resistance techniques. Following our initial trade idea with gold, we first project a textbook channel to our chart as price action has displayed three defining technical points (labeled A, B and C). 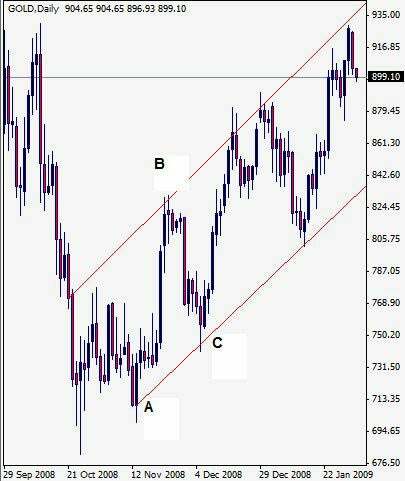 The gold channel corresponds with a short-term channel developing in the AUD/USD currency pair in Figure 4. The combination culminates on Dec. 10, 2008, (Figure 3 Point C). 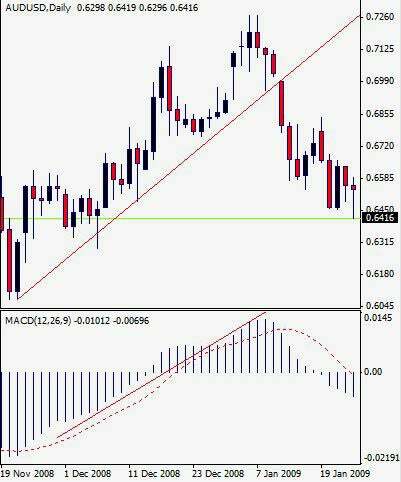 Not only do both assets test the support or lower channel trendline, but we also have a bullish MACD convergence confirming the move higher in the AUD/USD currency pair. Finally, we place the corresponding entry at the close of the session, 0.6561. The subsequent stop would be placed at the swing low. In this case, that would be the December 5 low of 0.6290, a roughly 271 pip stop. Taking proper risk/reward management into account, we place our target at 0.7103 to give us a 2:1 risk-to-reward ratio. Luckily, the trade takes no longer than a week as the target is triggered on December 18 for a 542 pip profit. Intermarket strategies like the Australian dollar and gold present ample opportunities for the savvy investor and trader. Whether it's to produce a higher profit/loss ratio or increase overall portfolio returns, market correlations are sure to add value to a market participant's repertoire.